Joe Case (Lucarelli) is a man from California who comes to visit a small Arizona border community. As an out-of-towner, he witnesses violence, corruption and murder at the hands of the local cops and sheriff. The main antagonist is Jake Wheeler (McRaney), a belligerent racist who has no problem dealing with the Mexican border-crossers...one way or another. Sheriff Mitchell (Brimley) also has an uneasy relationship with Wheeler, a loose cannon. Joe teams up with Dave Buchanon (Parker), one of the good cops, in an attempt to right the situation and bring Jake to justice. But will it be AMERICAN JUSTICE? Plenty of movies in the 80’s dealt with the subject of the U.S./Mexico border - even on this site alone we have Border Cop (1979), Border Heat (1990) (AKA Deadly Stranger) and now American Justice. THIS particular border movie isn’t really an action movie per se, it’s more of a downbeat, serious drama with some violence/thriller elements. The movie’s attempt at seriousness isn’t a bad thing at all, but the storyline is simplistic, and not a lot happens around it. The movie is almost airy, if that makes any sense. The odd, slow pace isn’t conducive to anything cohesive that will stick in your mind, and the movie becomes forgettable. Except for a few violent bits, it feels like a TV movie, which isn’t surprising, as that’s the medium director Gary Grillo spent most of his career in. Add to that the presences of McRaney and Parker, known for the show Simon and Simon. 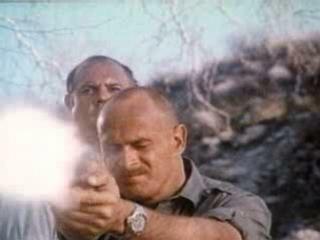 Of course, McRaney is also known as “TV’s Major Dad” as well. McRaney is well cast here and acquits himself well, and Wilford Brimley is a bright spot, adding what meat he possibly can to his small role, but there should have been MORE. More plot, more character development, more action, more suspense, more twists, more SOMETHING. While the VHS in the U.S. was released on one of our favorite labels, Lightning, the tagline used, “Justice from the barrel of a gun”, is sadly not lived up to. It makes you think a bigger, grander movie is forthcoming. Additionally, the box states the running time at 79 minutes, but it’s really 92. Why they did this is unknown. Did they think video store patrons might rent it because it’s not a big drain on their time? If so, it may have backfired, as people want to get as much for their money as they can, and they may have thought a meager 79 minutes is not worth the investment of a video rental. These are the things that keep you up at night. Or at least us. 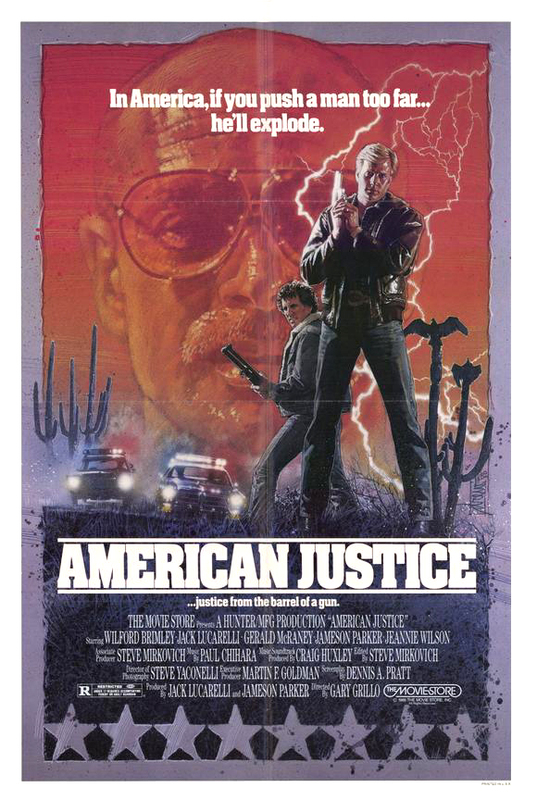 While not a BAD movie by any means, American Justice isn’t a great one either. File this one under “missed opportunity”. It is the showdown we have been waiting for! simone & simon! i remember this one too, and i thought the poster was cool, but felt the same way. it felt like a made-for-tv movie. Thanks! This should have been so much better. It needed more Brimley! Did Wilford Brimley check his diabeetus, and did he check it often? Today it becomes forgettable, I'm always down for 80s movies. Looks good. Anything with Wilford Brimly is worth watching. Dr. Blacksteed: Haha, he sure did! He called Liberty Medical. Real Queen Of Horror: Would be interested in your opinion! Wilford Brimley almost saves the movie. Hoaks2: It wasn't bad, it just needed a little more excitement and Brimley. Haha! Thank YOU for remembering Liberty Medical! Man, that cast looks prodigious, too bad it's unremarkable. What if it had been a Simon and Simon remake, with McRaney as a good guy and Brimley as the bad guy? That might have worked. Definitely agree with you! It would have made a better movie!